Always start organizing your kitchen with cleaning drawers. After cleaning drawers, go through the whole kitchen try to dispose off useless things. You may have old mittens, discolored cups and mismatched dishes and plates in your kitchen. These items are no longer useful for you so throw out these items to get rid of clutter and mess. Instead of throwing these items, you can also donate them as well. Buy some clear plastic bags and containers to keep cereals and pastas instead of preserving them in glass containers. Containers occupy more space than plastic bags and hence cut down on shelf space. Moreover plastic containers are easy to manage and keep. Plastic containers are also useful for keeping tea, sugar, coffee, dry milk and flour. These plastic containers also eliminate need of canisters. Your kitchen must also have a number of cleaning agents for dishwashing, bathrooms and floor cleaning. If these cleaning agents are more than one year old, throw them as they will create clutter and nothing else. But take care while disposing off these cleaning agents because if spilled on floor they can result in an accident. You will find instructions to throw them on back of their bottles or containers. Most of the times, cleaning products are kept under sink. When you will throw unnecessary bottles, you will find enough space to store other kitchen items like pots, pans, extinguishers and candles. You must also have a number of half-filled spice jars in your kitchen. 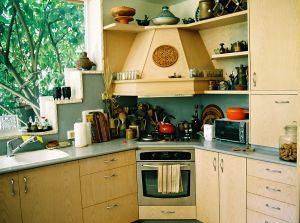 For organizing kitchen in a good manner, you will need to replace them with a spice rack. If you do not want to spend on expensive spice racks, you can use old baby food jars for this purpose. For using baby food jars, peel off labels and replace them with a tape. Use a black marker to write names of spices on tapes. By labeling these jars, it will become easy for you to locate these spices. These jars are transparent so it is easy to see how much spice is left in jar. Moreover these jars stack well and create more cabinet space. These were some of the most effective tips and tricks to keep your kitchen organized. Follow these tips and you will see a vital change in your kitchen.